Hello everyone, Effie here! For today’s post, I experimented extensively with our Princess Cut Diamonds layering set and several different embossing powders because this is the best technique to bring out the prettiest (and realistic) results from this stamp set. This post was inspired by Jess’ card which she made for our Second Release. I wanted to heat emboss these stamps in different embossing powders/glitter that I had and swatch them for future reference. 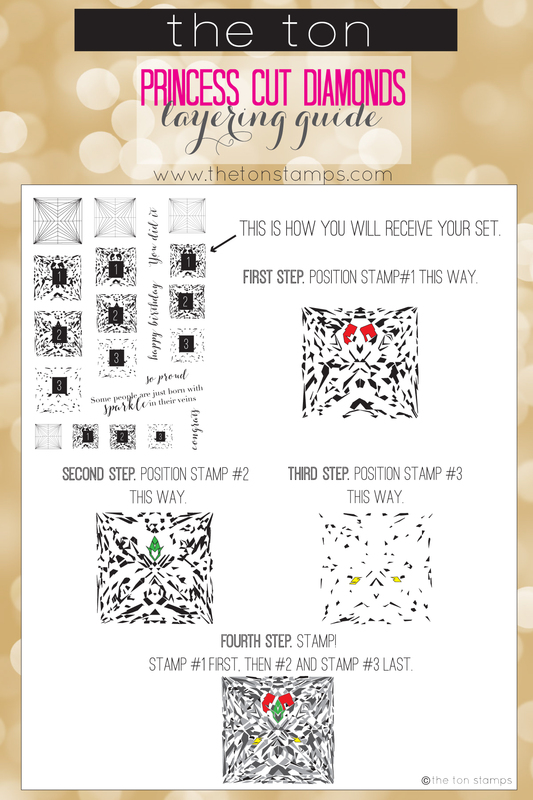 Throughout today’s post, I’ll be referencing the specific layers in this stamp set. Layer 1 = Stamp #1 as indicated in the layering guide. Layer 2 = Stamp #2, etc etc. 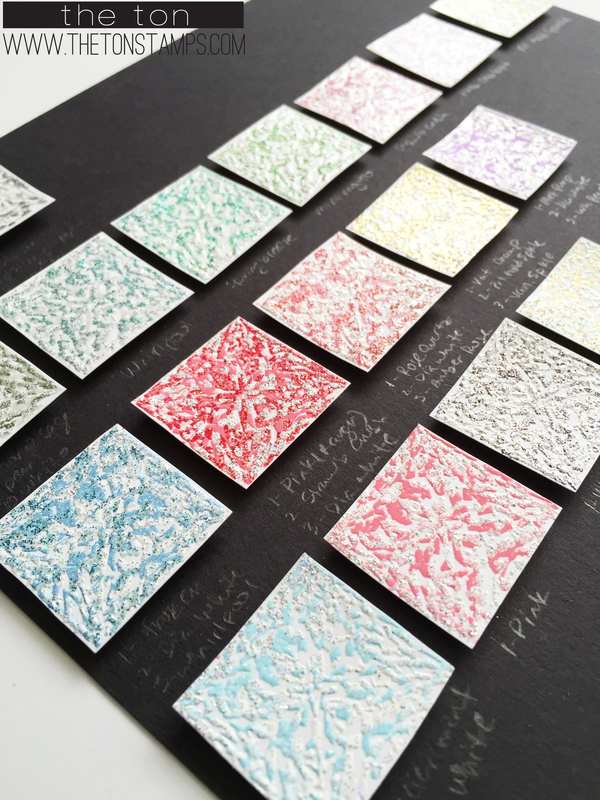 While I was experimenting with all the different powders, I used Versamark ink to stamp all the layers. For the embossing powders, I used mainly WOW embossing glitters (they have a great line of embossing glitter). Specifically, I found that WOW’s Diamond White was a staple during my swatching experiment. It’s consists of an opaque white powder with super fine silver and multi-colored glitter. In the diamonds in the photo shown above, I used Diamond White EP (embossing powder) for the first stamp layer. Then I experimented with different combinations for the second and third layers. I found that WOW White Pearl EP worked great as another layer for our Princess Cut Diamonds. I also added a layer of Zing Silver Glitter (second diamond above) with a third layer of White Pearl. This created a gorgeous realistic looking princess cut diamond! Here are some more color combinations that I came up with. For the two rows of diamonds layer 1 was heat embossed using WOW Sensational Sage, Whirlpool, Spring Breeze, Mint Mojito, Strawberry Crush, Pink Sherbet and Pearl Gold Sparkle embossing powders. 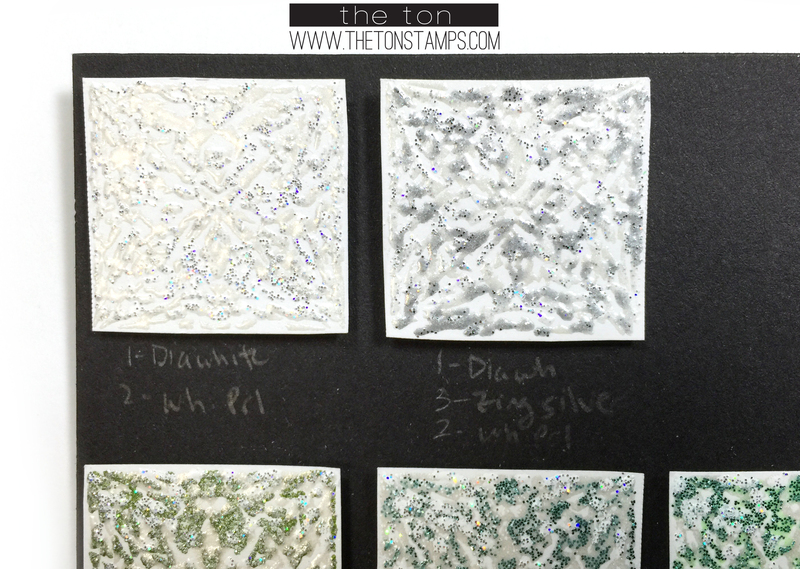 Then I embossed layer 2 with WOW White Pearl and layer 3 with WOW Diamond White. For this next row, I used different powders for each layer. I experimented with similar colored powders on top of each other. I used the following powders: first diamond (WOW Frozen, Diamond White and Whirlpool); second diamond (Ranger Pink EP, WOW Strawberry Crush and Diamond White); third diamond (Ranger Rose Quartz, WOW Diamond White and Amber Rose); fourth diamond (WOW Vintage Champagne, Pearl Gold Sparkle and Vanilla Sparkle). For this last row, I only stamped the first two layers. For the first layers on each diamond above, I used WOW Glacier Mint, Ranger Pink, WOW Vintage Amethyst and Ranger Enchanted Gold. I heat embossed the second layer with WOW Diamond White. 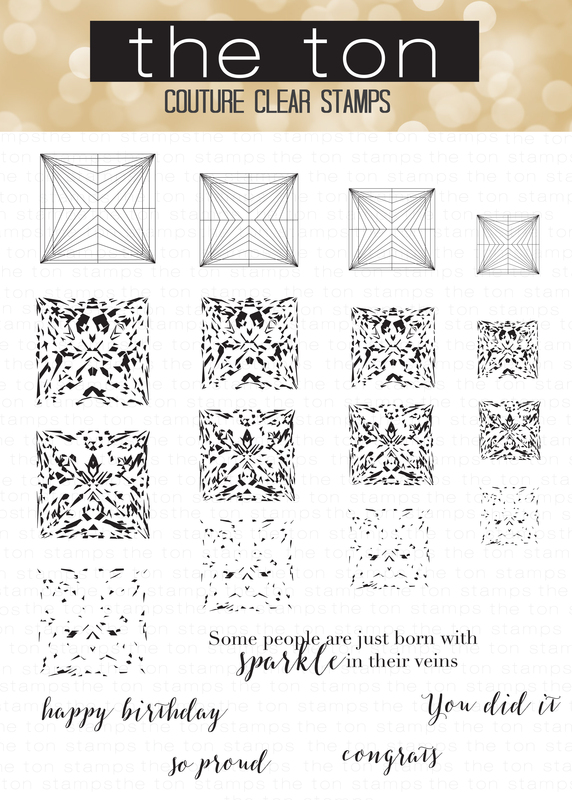 After I heat embossed each diamond and when I was satisfied with the results, I cut each diamond out and popped them up on my chart with some foam squares. I plan on adding to my diamond swatches with more color combinations when I have more time to play. However, until then, at least I have something to get me going next time I play with my Princess Cut Diamonds set. Now that I’ve created my sparkly swatches, the results are really beautiful!